Navy Wife Life: Red Wine? Anyone? Anywhere? So the other day me and my sweet baboo went and started to explore our new home and the surrounding area. 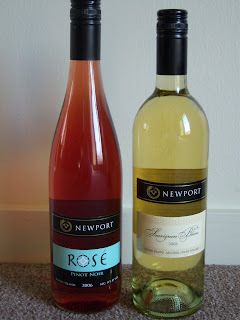 We came across the first winery, Newport Vineyards. After a tour we tried a few of their wines. Five each. The reds were kind of weak, but their whites were okay and we really enjoyed their Rose. Okay their reds were really weak. 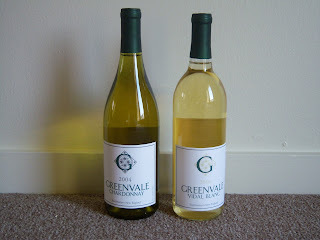 We took home two bottles, they are pictured below. They had some sweeter wines and we didn't get to try all of them. So I think we will be back. We then started exploring again and came across another winery totally by accident. Yeah for us! So we went in and tried more wines. They were quite nice and we went home with two more bottles. They are the first two bottles pictured. We enjoyed the wines here and will be coming back just to enjoy the small winery. One thing we did discover is that they don't keep their reds in oak for very long and the reds do NOT have much body. Guess this means we will be learning to appreciate whites out here. Another thing we learned is that they pour heavily out here. Yikes!